The Most Ridiculous Rumour of the Summer? Newcastle United's hunt for a striker continues and the latest name linked is Anzhi's big money signing, Samuel Eto'o. The Cameroonian became the worlds highest payed football when he joined the Russian club, earning £350,000 a week. However the club have hit financial problems and are reducing their budget by 60%, meaning their big names have all been linked with moves away from the club. Newcastle have been forced to look elsewhere for a forward after being priced out of a move for Lyon’s Bafetimbi Gomis by Marseille. Samuel Eto’o is available at a cut price £5 million apparently, but that’s only half the story: his wage demands exceed those of Cristiano Ronaldo’s. Newcastle have been looking for a new striker since Demba Ba left for Chelsea last season. Ever since Ba left Newcastle haven’t really found a prolific replacement to back-up Pappis Cisse up front. The Tyneside club will be looking to improve on last season, in which they finished 16th. And with deals for Gomis failing and Darren Bent not progressing as smoothly as was hoped, it’s been a turbulent summer to say the least. 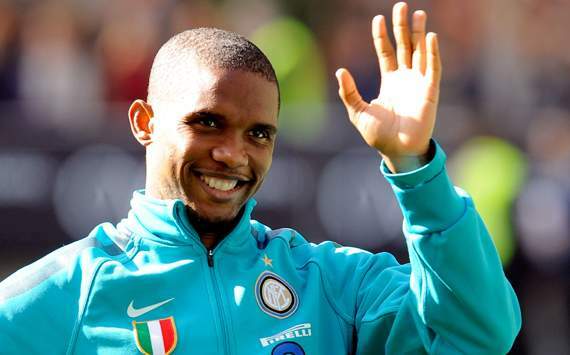 Eto’o started his career at Spanish giants, Real Madrid, but failed to break into the first team. A loan deal made permanent at Real Mallorca really kickstarted his career in 2000 as he scored 69 goals in 165 appearances. This form attracted big clubs from around Europe and in 2004, Eto’o signed for Barcelona. Eto’o was in prolific form at the Nou Camp, scoring 129 goals in 201 games, before joining Inter in 2009 as part of a monster deal that saw Zlatan Ibrahimovic go the other way. He won the Treble at the San Siro under Jose Mourinho. In 2011, with billions of pounds available to spend, Anzhi Makhachkala came calling and offered him the highest wages a footballer had ever received. He has been in good form internationally as well, scoring 55 in 112 games for Cameroon. The Toon Army will be keen for the club to add to loan signing, Loic Remy. But I highly doubt Eto’o is the feasible answer.